It would be almost impossible to claim to not like Lend Me a Tenor the Musical. To do so would mean turning one's nose up at the original and legendary Broadway comedy written by Ken Ludwig, from which the Pacific Conservatory Theatre's current musical production was adapted. A musical, Broadway or otherwise, should leave you feeling either despondent in the depths of your soul (thanks, Kiss of the Spider Woman) or bouncing around like Kevin Bacon in an abandoned factory, ready to jump on cars and belt out big finale numbers. Lend Me a Tenor the Musical is a bona fide, booming big Broadway-esque spectacle, crying out for bigger attention. With music and lyrics by Peter Sham and Brad Carroll, the production is a musical adaptation of Ludwig's hit play, which tells the story of Max, a lowly assistant at the Cleveland Grand Opera House. He is in love with Maggie (Caroline Whelehan), who is smitten with Tito Merelli (George Walker), who is head-over-heels for anything with "booooosums," as his wife, Maria (Bree Murphy), so fondly explains. Henry Saunders (Eric Stein) is the fired-up opera house manager on the brink of losing everything and having a nervous breakdown. Diana Divane (Karin Hendricks) rounds out the cast as the siren who is tired of playing in Cleveland. Merelli is supposed to perform Pagliacci, an event sure to save the failing opera house. When Merelli is accidentally drugged, Saunders and Max think he's dead and—I'm going to let you see for yourself, mostly because it would be impossible to describe in written form the sheer number of comedic bits stuffed into a more-than-two-hour play. The genius of Ludwig's original production was in how the play managed to keep so many gags going, all of which relied on the ignorance of so many other characters, in one small play. The script fires off jokes like a machine gun, each one pinging off the next in a never-ending stream of comedic timing. The biggest challenge for Sham and Carroll is identifying moments of calm (or chaos) when the break to a song feels natural and not a disruption to the steady flow of comedy. I think they handled it well, and even managed to sneak a few ballads into a play that barely allows actors room to catch their breath. 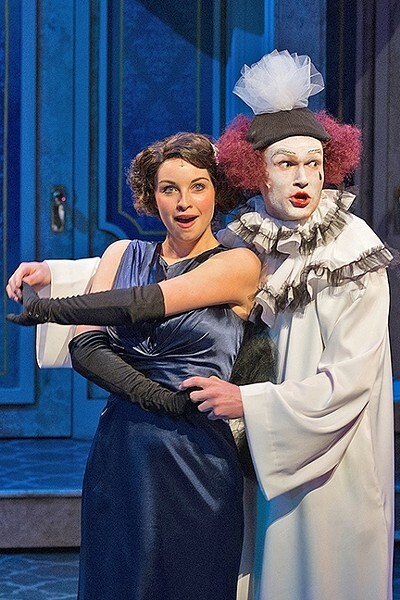 Lend Me a Tenor the Musical is a giddy masterpiece of sorts. It has all the right components of what makes a tremendous musical sensation. A quirky, opposites-attract romance? Check. The hilariously absurd misunderstandings found in a typical farce? Check. A bellowing, boisterous supporting cast that offers up the biggest laughs of the night? Check (Stein as Saunders) and triple check (Kitty Balay, Meami Maszewski, and Vivian Vaeth as the opera guild ladies). Carroll and Sham have ticked off all the boxes with an impressive selection of songs that leave no doubt that this is a hit maker. "How 'Bout Me" is a great toe-tapper, and "Be You'self" is that kind of once-in-a-blue-moon power duet that culminates with big vocals, just the kind of number you expect and want to hear in the first act. Another standout number is "For the Love of Opera," which features deadpan comedic brilliance from Wallace and Murphy. The number delivers a satirical take on the over-the-top welcome-to-our-thing-we're-having numbers from Beauty and the Beast's "Be Our Guest," to Annie's "I Think I'm Gonna Like It Here." I personally could do without the scenes where two separate men trick two different women into bed with them. The scenes bring up uncomfortable issues and isn't helped at all by Max's feeble mea culpa (which is still a good song). The scene feels better left in the 1980s, when conversations about informed consent weren't as prominent. Whelehan is easily one of the best young singers in musical theater; her voice tells every nuanced beat of her character's soul. But "Fling" is such a good number that it needs something more. Whelehan's Maggie is trying to convey unbridled lust and attraction, and I just wanted to see her leap around that stage and fling herself into the music. Another star is Ogren, an absolute geyser of talent. He carries Max from humiliated nervous wreck into a bold maestro, and it's evident in just the slightest evolution in physicality from the young actor. 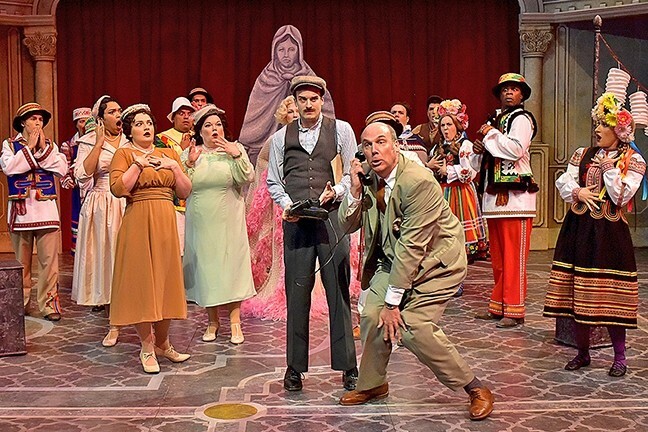 GET A GOOD LAUGH: The Pacific Conservatory Theatre presents its production of 'Lend Me a Tenor the Musical' showing through May 14, Wednesdays and Fridays through Sundays at the Marian Theatre, 800 S. College, Santa Maria. Cost is $29.50 to $39.50. The show will run at the Solvang Festival Theater July 6 through 23. More info: 922-8313 or pcpa.org. Hendricks, who steps into the role that earned Sophie-Louise Dann an Olivier award nomination in 2012, spares no time in cementing herself as one of the highlights of the musical. "May I Have A Moment" is a stunning vocal runner, hitting on samples of classic opera highlights that you won't believe one woman could get through in three minutes. All in all, the talent and toe-tappers make the production a rousing success (as the audience's minute-long applause breaks between songs will convince you). If you've ever wanted to see what a true Broadway hit would look like before it ever got to Broadway, this is your chance. Santa Maria Sun Arts and Lifestyle Writer Rebecca Rose sings show tunes when she's getting ready for work. Contact her at rrose@santamariasun.com.